India is a store house of exciting places to explore. One of the many popular tourist destinations in India is Rajasthan. This state, lying of the Thar Desert, has a number of places that are excellent tourist destinations. Rajasthan also happens to be the largest Indian state, in terms of area. Interspersed with forts and tombs here and there, this entire state is a very interesting place to study as well as explore. Needless to say, the capital of this state-Jaipur is also a popular tourist destination. It is also popularly known as the pink city. Pink is believed to be a colour that shows hospitality and hence when Queen Victoria and the Prince of Wales had come to visit the city, the then king had painted it Pink. Since then it has quite often referred to as the pink city. Being a popular tourist destination, there is no dearth of jaipur hotels and resorts. If you do plan to visit this city, which is a strongly recommended place to visit, then accommodation will never be a problem here. The Pink City was once all decked up to show its hospitality to the two British visitors, now this capital city has everything that one needs to extend its hand of hospitality, once again, to its tourists. 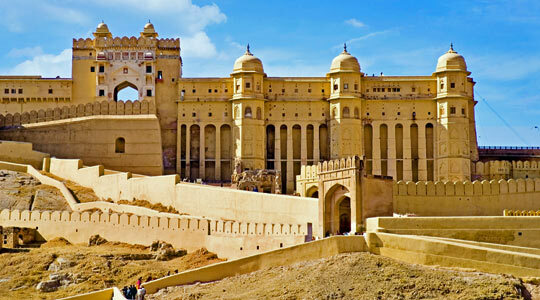 Amer or Amber Fort: If you want to talk style, elegance and reminisce of extravagance, then you cannot help but refer to Amer Fort. This majestic fort was once occupied by the Rajputs and their glory is still reflected as one makes their way through the various rooms and corridors of the fort. It is located on top of a hillock and you can either take a car or an auto up there. It overlooks the splendid Maota Lake, which paints a really pretty picture. Light and sound shows are conducted in the evenings, which is also something that will help you relive the Rajput prowess. It remains open for general visiting from 9:30 in the morning to 4:30 in the evening. The light and sound shows are conducted after that. This is the main fort of this city. Nahargarh Fort: Jai Singh II commissioned the construction of this fort whose main function was to look after the city’s defence. It is also thus known as the Tiger Fort. The timings are the same as that of Amer Fort. You can get a splendid view of the entire city from this fort. You can simply book a car from resort jaipur and head out to explore this fort. Jaigarh Fort: If you want to talk about water reserves, granaries and an excellent sewage system, Jaigarh or the Victory Fort is the one would want to refer to. Built by Jaisingh II, this fort remains open from 9:30 AM to 4:30 PM, for the tourists. These three are the most important forts of Jaipur, of which Amer Fort is the most prominent one. Your trip to Jaipur will remain incomplete if you miss out on any of these three!